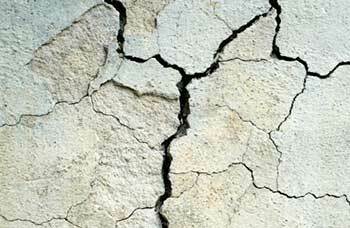 Repairing larger cracks or holes in Precast Concrete is quite different to repairing small hairline cracks or holes. Before you start to repair the holes or cracks, you need to first clean the crack or hole thoroughly to remove any oil, dirt or debris plus the surrounding wall surface. Pay special attention to the insides of the cracks or holes to make sure they are thoroughly clean to enable the sealant to adhere to the surface. Enlarge the hole or crack just below the surface with a cold chisel and hammer. Hold the chisel at an angle inside the crack or hole and chisel down to a depth of about 25 to 30mm. Do this the entire length of the crack and around each hole. Reverse the angle and repeat the procedure. The whole objective is to create an inverted V shape below the surface, which is also known as undercutting. The chiselled surface provides a stronger bond with the sealant, and the diverging angle of the crack helps keep the sealant within the crack. Remove any dust and debris from inside the crack or hole. Mix enough ready-mix concrete with water to fill the hole or crack and apply quickly. Use the handle of your trowel to press the mixture into the holes and cracks. Smooth it over the surface evenly and cure the repaired spot properly before sealing with a silane-based water repelling sealer. You are also able to chip a hole into a square shape and then insert a new block of concrete into the hole. Our advice is that you hire a professional to do the repairs for you to ensure you have the best professional help you can find. 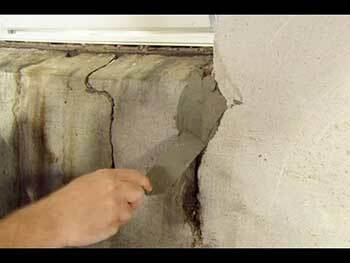 The experts know how to fix large cracks and holes and seal it so that it will be both aesthetically pleasing, and not detract from your property value, and also long lasting. Make the decision today to call us to discuss all your requirements with one of our highly trained consultants, who will gladly assist and advise you, or give you a free quotation.